1.5 GB RAM, 80 GB Hard Drive, Intel Corp. Mobile 945GM/GMS/940GML Express Video Card. 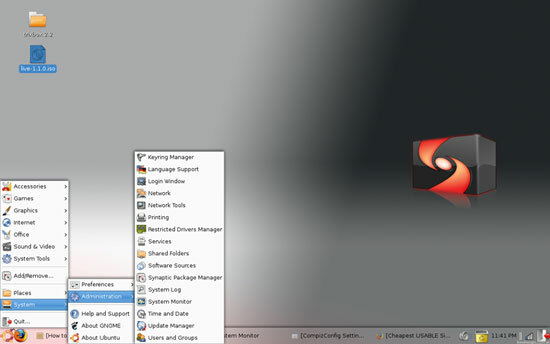 Dual boots with Ubuntu and Windows Vista. Ubuntu detected all the hardware but the Atheros AR5BXB63 wireless card. Installing the Windows driver with NDIS Wrapper didn't seem to work, so I just pop in an Orinoco Silver and wireless works fine. Compiz Fusion, screens are dynamic and flexible. This full screen window is pulled down from the top to see the windows behind it. 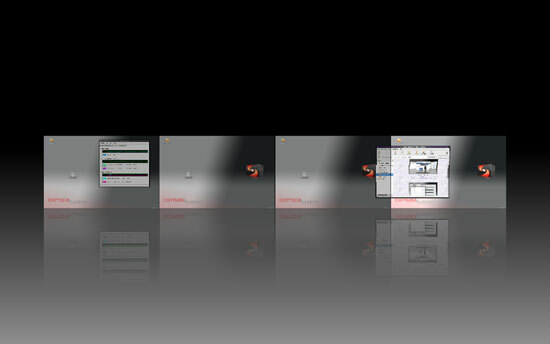 This is the Shift-Switcher. The reflections are awesome. 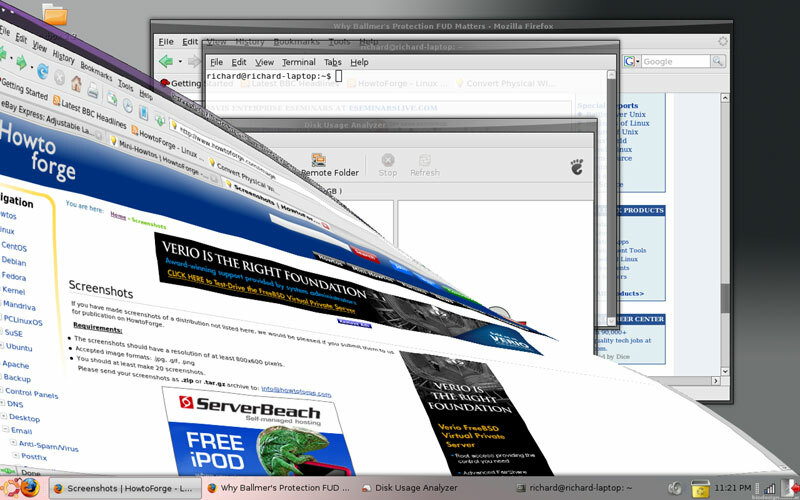 It flicks between windows very smoothly. Transparency is very high quality even on non Nvidia cards. This laptop uses an Intel Corp. Mobile 945GM/GMS/940GML Express Video Card. Windows stick to the edges and bend when you push them. 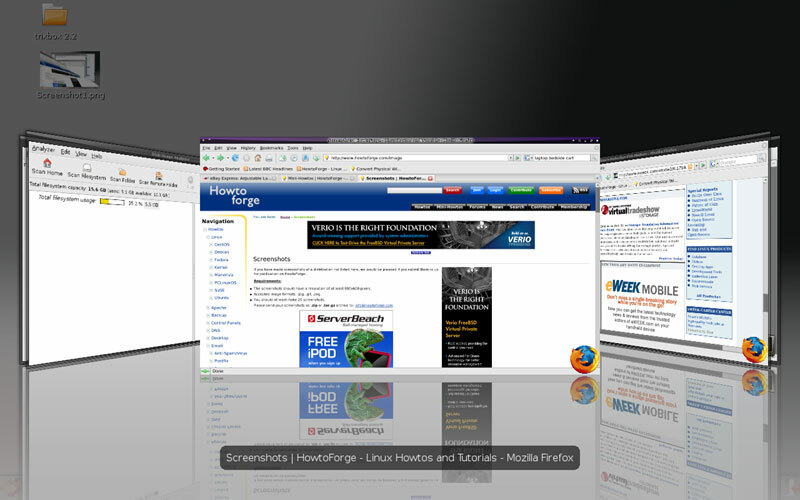 The desktop cube rotates smoothly and precisely. 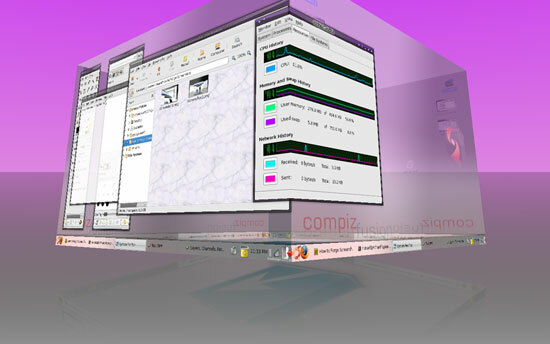 In Compiz Fusion the cube has a nice reflection. Windows look sharp wrapped around the corners. 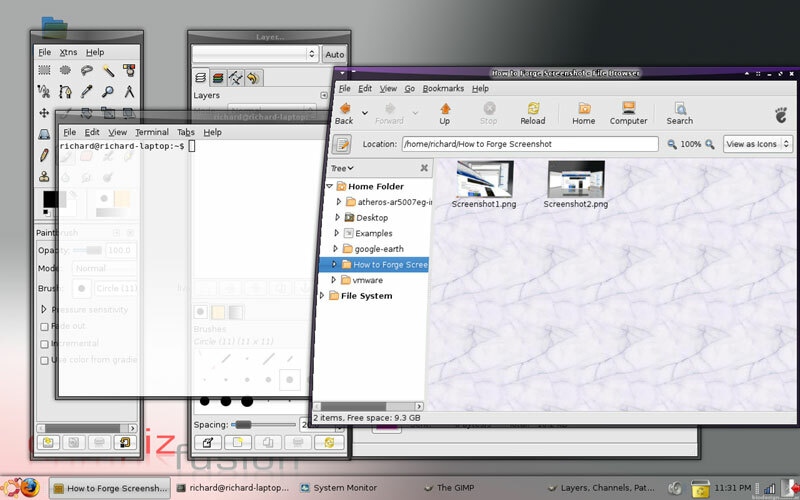 The Compiz Fusion Expo plugin lets you see all desktops one one screen. You can move windows from one desktop to another and then click on the desktop to switch to it. It has awesome reflections. Paint/draw with fire on the screen - awesome eye candy. The Gnome desktop is highly configurable and looks sharp with menu shadows. Google Earth runs very nicely on Ubuntu Linux. 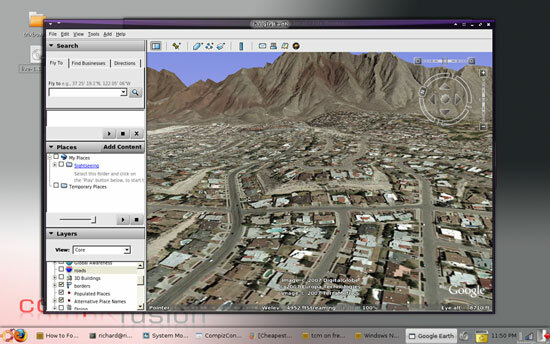 The shot is a 3D, tilted view of my neighborhood. 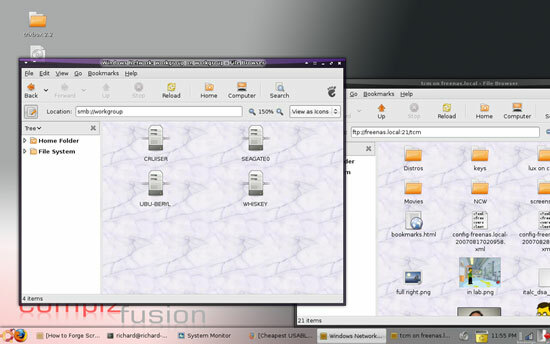 Ubuntu easily recognizes a Windows network and UPnP devices (in this case a freeNAS freeBSD Server with movies, music and Linux distros.) The freeNAS boots from a compact flash and currently has one 160 GB drive.